The I Love Lucy Show was a 30 minute comedy series on CBS about a Cuban bandleader (Ricky) and his American, wacky, red-headed wife. Ricky was a headliner performer at the Tropicana Club and actually, a star. He really did love Lucy very much but love is not everything! He wished that she'd be satisfied to be a wife and mother. She also had enormous love for her husband, but longed to be a star just like Ricky. She would pull every trick in the book to perform at the Tropicana even though it was clear to everyone that she had no real talent. Occasionally she got a taste of show biz but, of course, she always messed up! Perhaps the best-known example was in I Love Lucy episode #30, "Lucy Does A Television Commercial". Lucy got hired to do a commercial about a health product called, "Vitameatavegamin". After several takes it becomes evident that the product is pretty high in alcohol content! Lucy ends out drunk by the end of the episode! In the fourth season of I Love Lucy, Lucy, Ricky and their landlords/friends the Mertzes headed for California where Ricky was being offered a movie contract. These episodes were especially popular as many people of that time had little or no opportunity to travel and it was very exciting to watch! Also, it gave the writers an opportunity to interact Lucy with many top celebrities of the day in California. This was the first program to be recorded directly on film rather than kineoscoped (filming a TV screen). It was also the first to use the "3 camera" process allowing the scenes to be filmed from different angles (That was actually Desi Arnaz's idea and became the industry standard)! Written By: "Harold Adamson and Eliot Daniel"
The Complete Series on 34 Dvds! 1.. In "The Kleptomaniac," what do Lucy and Ethel steal? 2.. What do the Ricardos hunt in the episode "The Camping Trip"? 3.. In which 1965 movie did Vivian Vance co-star with Tony Curtis? 4.. How many Emmys did the I Love Lucy Show win? 6.. Which episode contained the longest laugh and how long was it? 7.. What was different about the opening credits for the TV show in syndication versus those originally aired? 8.. In which episode did the real life daughter and son of Lucille Ball and Desi Arnaz both appear? ..... Eisenhauer, or the coronation of Queen Elizabeth? 10. On what ocean liner did the Ricardos and the Mertzes travel to Europe? 11. In what Classic Christmas movie did William Frawley co-star? 12. What scene did Lucille Ball brilliantly ad-lib in episode #19 - "The Ballet"? 13. Did the Mertzes own a dog? ..... throwing out her window? 15. Name two signifigant events that happened on January 19, 1953! 16. Which TV show episode was the first to use scenes shot on location? ..... help her boss escape from a phony murder charge? 18. What was the name of the Frenchman who teaches Lucy the apache dance in "The Adagio"? 19. How did the show's writers choose Ethel and Lucy's jobs in "Job Switching"? 21. Did Lucille Ball ever use a "stage name"? 22. In what 1992 movie does Desi Arnaz Jr. play his father Desi Arnaz Sr.? 23. Why did the Lynn, Massachusetts PTA picket their local CBS television station? 24. What was the name of Lucy's salad dressing? 25. Ricardo was not the first choice for a last name. What was? 27. In "Lucy Does The Tango" what do Little Ricky and Bruce Ramsey hide? ..... Ball on their 13th anniversary? 29. What TWO distinctions does Lucille Ball have with TV Guide Magazine? 31. Many famous stars played themselves on the show. Name 4. 32. What was Desi Arnaz's full name? 33. How many different hair colors did Lucille Ball have during her career? 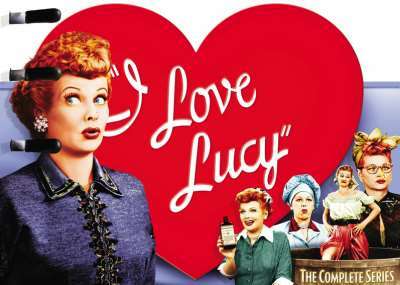 Before the TV show, there was an I Love Lucy radio show, but it unfortunately only aired the pilot episode on February 26, 1952. Lucille Ball, however, did appear on the highly successful My Favorite Husband radio show which aired for 126 episodes from July 23, 1948 through March 31, 1951! That program was very similar to I Love Lucy in that Lucille Ball played a "ditsy" wife who was always getting into trouble. Episode #26, "The Marriage License" was the first episode of a television program that was watched in more than 10 million homes! Questions at the top of this page. 6.. "Lucy Does The Tango" had a 65 second long laugh. ..... Desi Arnaz, and Phillip Morris cigarettes were used originally. 8.. In the final I Love Lucy Show episode, "The Ricardos Dedicate A Statue". 9.. "Lucy Goes To The Hospital" - the episode where Little Ricky is born. 11. "Miracle On 34th Street"
12. Lucy's foot getting stuck in the practice bar was really an accident! 13. They had a dog named Butch in episode #3 - "The Diet" but he was never mentioned again! 14. The "Mockingbird Murder Mystery"
15. Lucille Ball gave birth to little Ricky on the show and to Desi Arnaz Jr. in real life on the same day! 19. They simply looked through the Yellow Pages. 23. They felt the show was broadcast too late for their children to stay up and watch! ..... show was originally to be called the Lucy and Larry Lopez Show. 26. "The Long, Long Trailer"
..... covers than anyone else! 30. "I'm sorry your mother looks like a weasel!" 32. The full name of Desi Arnaz was "Desiderio Alberto Arnaz y de Acha III"! 33. Lucille Ball's original color was brown, then she changed to blonde, and finally to red! Thank you for visiting our I Love Lucy Show page!